Formed by The System (Sistema de Orquestas Infantiles y Juveniles De Venezuela) Whit Master Felix Petit. Master’s classes, continued training and Orchestral working with Masters like Janne Saksala (1st principal bass in Berliner Philharmoniker), Nabil Shehata (Principal Bass in Berliner Philharmoniker), preparing all the univarsal repertory for orchestra. Played whit masters like Claudio Abbado, Sir Simon Rattle, and Gustavo Dudamel, between others great Masters. 8 years in Simon Bolivar Sinfony Orchestra(Venezuela), 9 years in Venezuela’s Sinfony Orchestra. 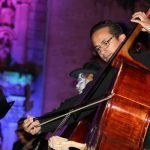 Actually 1st Doblebass Solist in Oaxaca Sinfony Orchestra in Mexico and Techer in Bellas Artes University in Oaxaca. I’d like to share all that life has give to me.